I had this broad-band gray knit strand. It wasn’t quite as soft and cottony as t-shirt yarn, so I thought this was a good chance to make a biggish and firm rug. Or basket. Or rug. I started single-crocheting around in a spiral with my no. 15 hook, stretching out the loops at the end of each stitch to make sure it didn’t round in and I could postpone the decision of whether it would be a rug or a basket until… That was it, and it was time to go up now – or forever be flat on the ground. I went up, and crocheted around the edges until the fab-yarn* ran out. Luckily the sides were just tall enough to keep a something in the basket. I then pulled out the pink strand with black polka dots. It was just right for the trim, which I made in the reverse single crochet stitch (rsc). There was enough left for a cute bow tie. 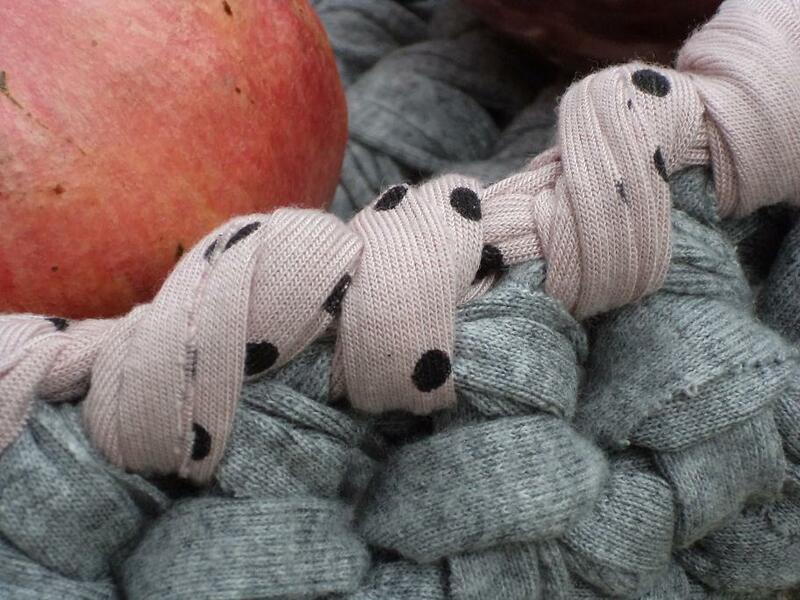 I know it’s a little too much but I couldn’t resist it… Pink polka dotted yarn has a certain effect on me. By now I’d decided the something in the basket would be pomegranates. 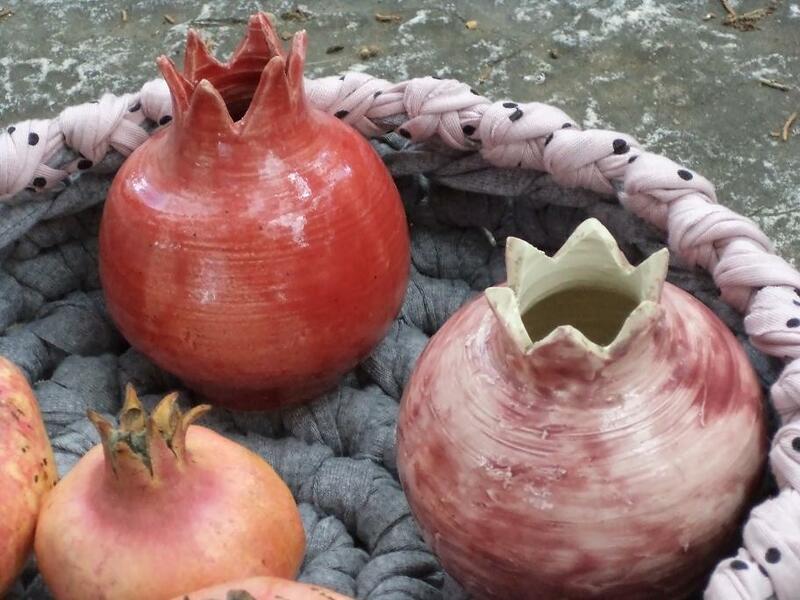 I started with two beautiful ceramic pomegranates (made by Ayelet, like all the beautiful ceramic art in my photos). One of the pomegranates has a dusty pink shade that reflected the pink strand nicely. Pomegranates are in season here and they are a symbolic fruit for the coming Jewish New Year, too. The two ceramic treasures were joined by some real ones. If only the new year could be as sweet as pomegranates! 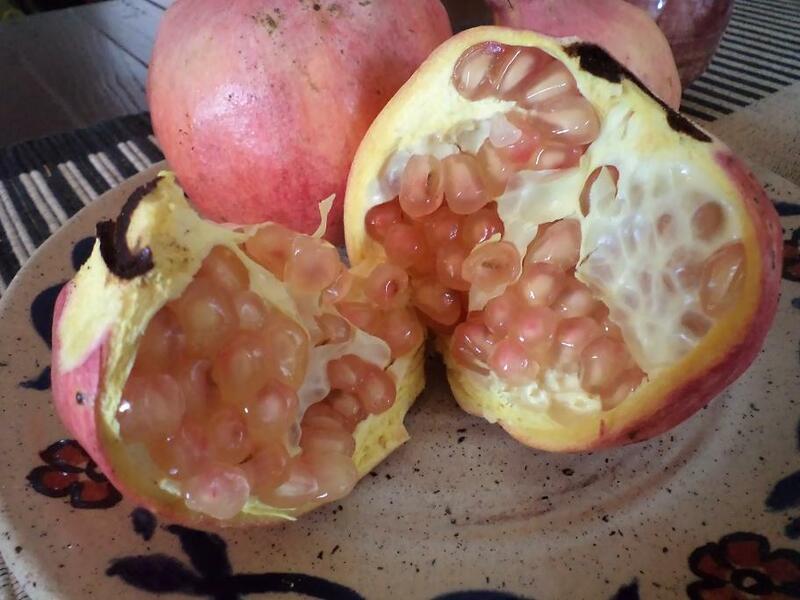 The pomegranates are delicious (the edible ones). *Fab-yarn is a term I invented, it’s short for fabric yarn, and if it hasn’t been invented before, I get cheers and claps – but only if it catches. I’ll Google it in a few weeks (or years?) and we’ll see if it’s out there! 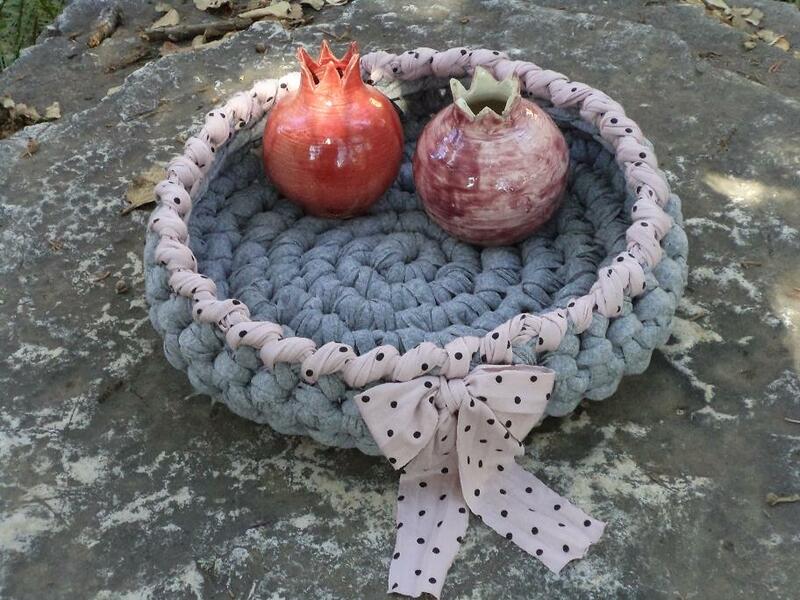 This entry was posted in Projects and tagged basket, crochet, crocheting in a spiral, DIY, fabric yarn, pomegranates, Projects, t-shirt yarn, tarn, trapillo, Zpagetti on September 22, 2014 by The Basket Fairy. The place where I buy fabric yarn had black on sale. I’m not big on black for home décor, but it occurred to me that I do need a new handbag. Badly. After some crocheting and un-crocheting I figured out the problem with fabric-yarn bags: They can be very weighty. I realized the bag I was trying to make would outweigh my present sack before I ever put anything in it. 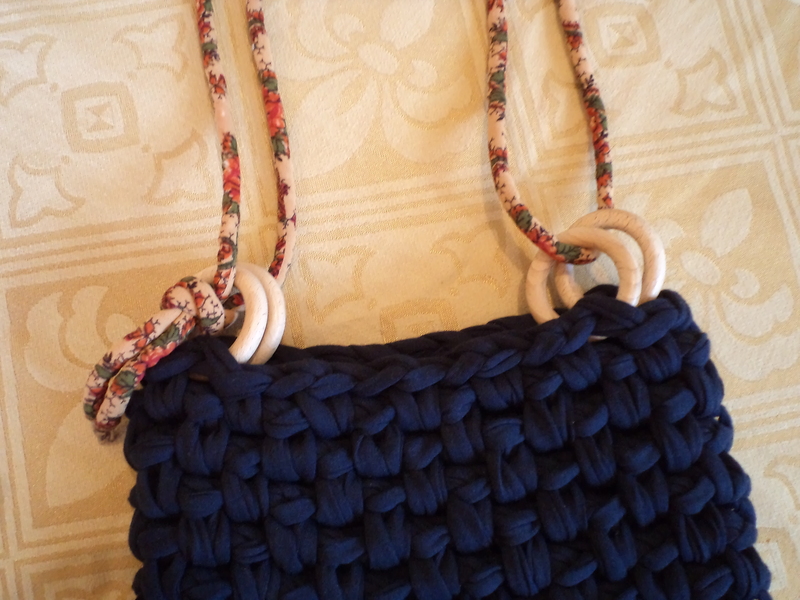 I decided to try the unlikely approach: Instead of going for dainty and delicate as I had done, which resulted in a tightly-textured, sturdy but very heavy tote, I would go for loose and large – more air, less weight. 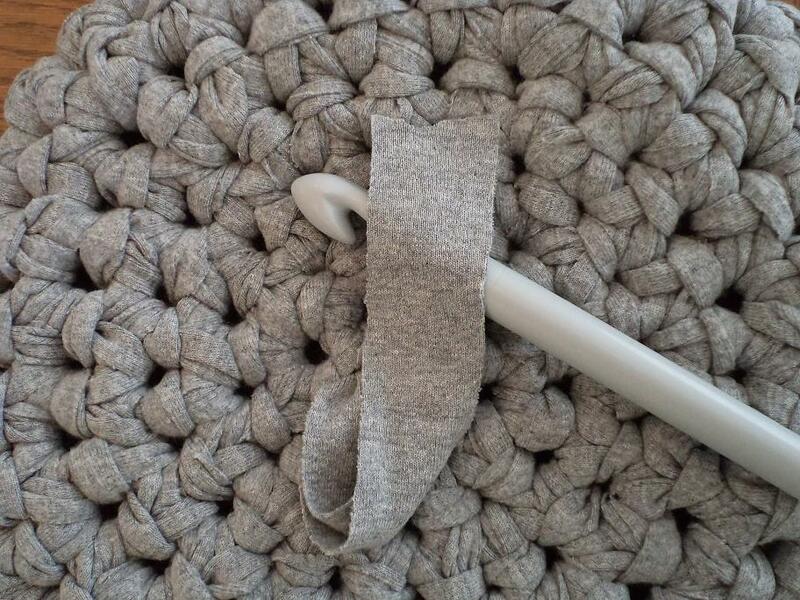 Out came my no.15 rag-rug hook. I made a small oval base starting with 9 stitches using the chainless foundation method (link below if you’re not familiar with it). For the second row of the base, I used single crochet worked into the back loop (I’m using American crochet terms here). I increased as necessary at the ends to create the half-rounds of the oval (for more details on the oval base, roll on down). From then on I just went straight up with the woven stitch (no more increases at ends of rows). 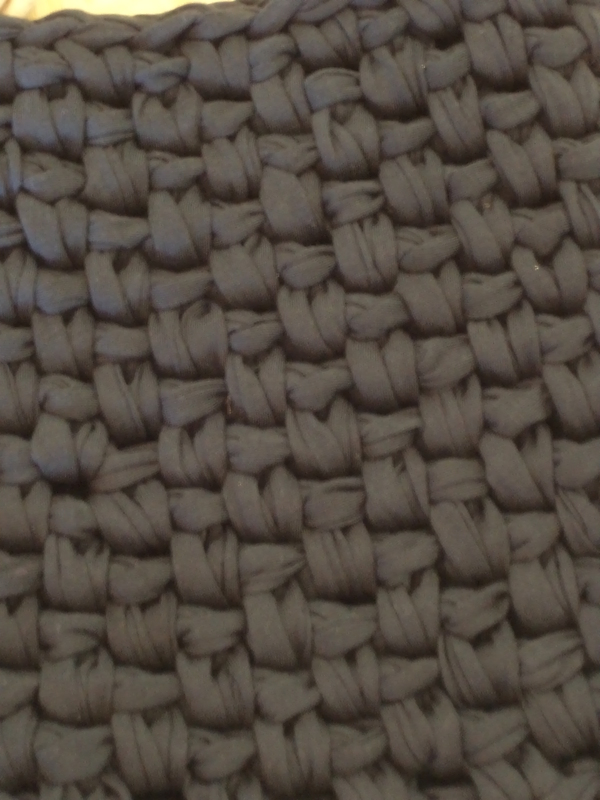 The woven stitch is a really cool stitch because it is so simple and yet the texture really looks like checked or woven fabric. It’s made by working 1 single crochet, then one chain, and skipping a stitch in the previous row, and so on; In the next row, you alternate and work the single crochet into the gap where you skipped in the previous row, then chain one and skip. Besides the cool checked effect, you get texture that is strong but not dense, and while there are skips and gaps, what you see – and get – is pretty solid, no visible holes, no functional gaps for things to fall through. 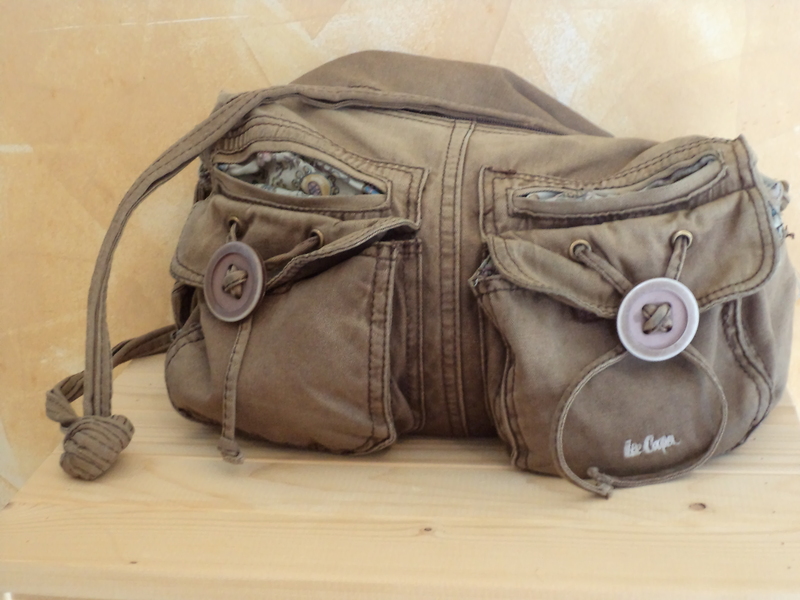 So with the big hook, and all that air worked in – you get a bag that is light and yet tight. 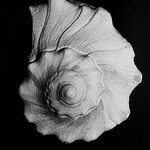 The body of the bag was worked in a spiral. Of course you don’t really see a spiral; When you finish the oval base, you just continue working into the last row of of the base with the woven stitch. When you finish the first row of the woven stitch you don’t slip stitch and chain two etc., instead you continue working into the first stitch of the first row and on from there. No stop signs, no traffic lights, just crochet on and on until you reach the desired height. I made 15 rows for the body of the bag. Just one thing: Finish the last round at the side edge of the bag so you don’t see a jump in height, and use an invisible join after the last sc you make. This will happen after you attach the rings. The rings: While working the last row, I attached the rings (wooden curtain-rod rings). Here’s how: After completing the first sc stitch from the side of the bag, you push the hook into the ring and draw the yarn from where it was, and complete a chain stitch with the ring inside it. Skip one stitch on the row below and insert the hook for the next sc as you normally would, keeping it tight to help fasten the ring securely. Complete the single crochet: Ring attached. As you near the end of the row, attach the second ring in the same way starting one before the last stitch, so it is the same distance from the edge. Do the same on the back side of the bag, for 4 rings in all, making sure they are aligned and in equal distance from the edges. So, where did I get that cord? I had a stash of goodies given to me by a loving family member. In our family, stashing Useful Things That Can Be Made Into Something crosses generations, and sometimes, so do the stashes themselves. I think it must have been a belt for a dress somewhere in the seventies. It’s strong enough to carry the weight of the bag, but soft enough to distribute it comfortably. I should say, the bag is not very big and not intended for carrying very heavy things. I tested it with a water bottle, a phone and sunglasses and it worked. 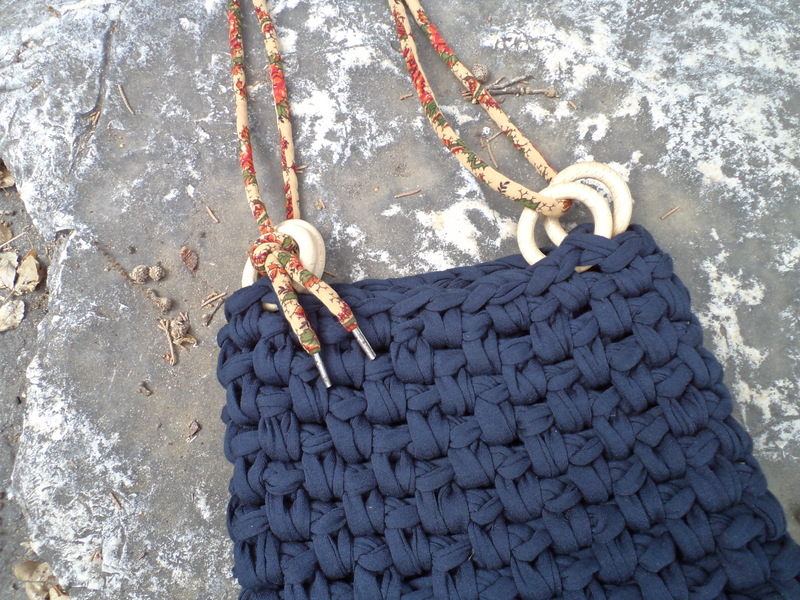 Notice the bag is worked in a continuum, which is what the spiral does, so there is no stitching, no matching, no stopping and going, one piece to crochet, and one piece visually – a small item that has one basic pattern (besides the base) which makes it neat and smart, creating a kind of contrast with the true nature of fabric yarn, which is soft, rustic and uneven. That true nature is still there but kind of in hiding, which is what makes it cool. It’s almost autumn so I took some pictures with a mug of tea and a couple outside under the oak tree with some romantic and very authentic autumn leaves. The pretty mug was made by Ayelet. How I made the oval base: So, the inside of the oval base is the foundation row which already has sc (single crochet) worked into the chain, and you work sc on the other side as well. I made the necessary increases to create the half-rounds at both ends of the foundation chain. 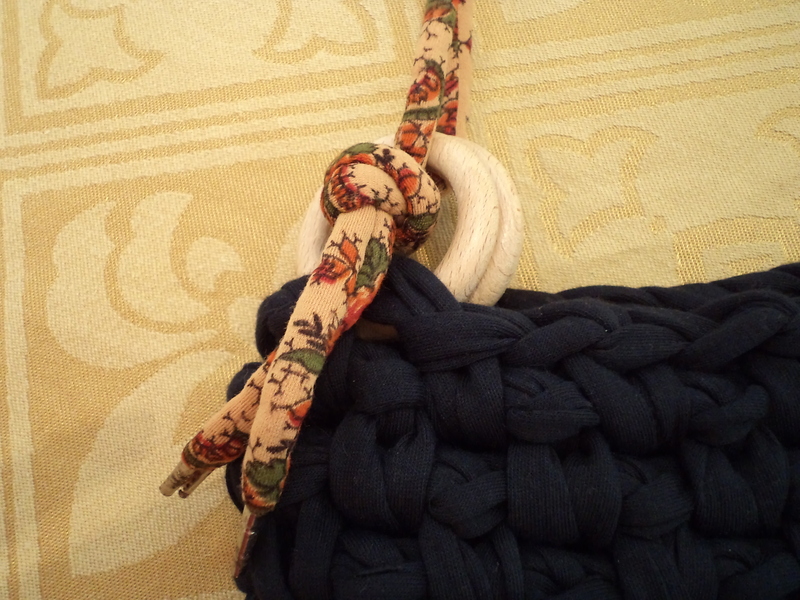 How to increase at the ends of the base to create the oval: When you’ve completed the 9 stitches of the chainless foundation as below, *sc again into the last chain, chain 1, sc crochet again*, then start working the other side of the foundation chain. When you reach the other end, repeat from *. Slip stitch into the next stitch (which is the first sc of the foundation chain). Ch 1. *Sc into the back loop of every sc for next 8 remaining stitches. Increase for next 3 stitches to create the round*. Repeat from *. Now sc into the ch1 you made at the end of the previous row, and continue with the woven stitch in a spiral from there. So the first row of the woven stitch is worked into the last row of the base, and note that since it is a woven stitch it is done the normal way, not into the back loop. 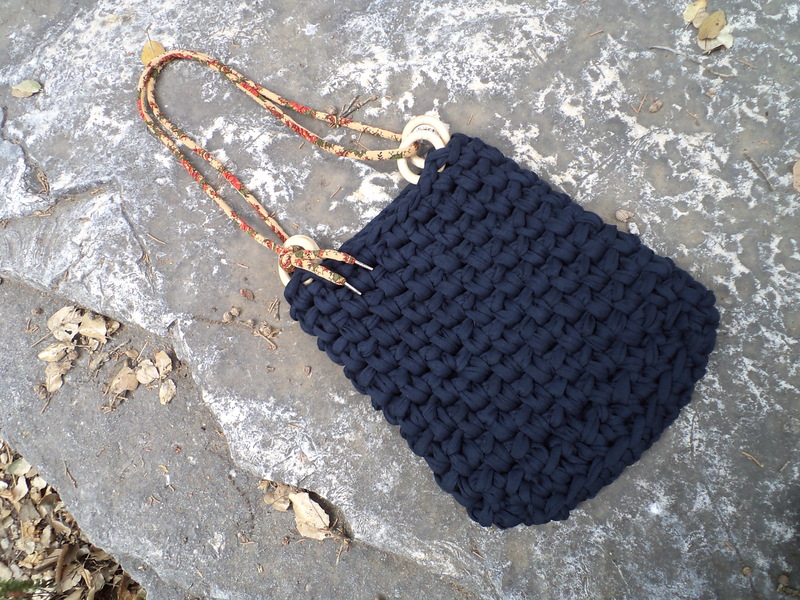 This entry was posted in Projects and tagged Black, crochet, crocheting in a spiral, DIY, fabric yarn, handbag, Projects, t-shirt yarn, tarn, trapillo, woven stitch, Zpagetti on September 2, 2014 by The Basket Fairy. I used a 9-10 hook. I made a magic ring, then single crocheted into it and started going around in a spiral. 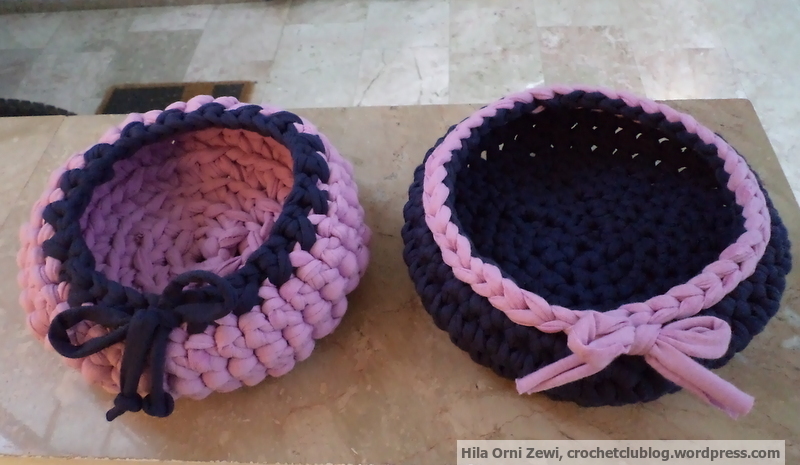 For the blue basket, I crocheted inside the stitches (the usual way), and for the pink basket, I crocheted into the back of the loop. I increased intuitively, creating a small flat base (usually, increases for double crochet are about 6 per row). When the base was big enough (about 15 cm, I think) I stopped increasing and just crocheted around till the basket was tall enough (about 6-7 cm). I closed the spiral by crocheting the last couple of stiches a little more tightly, and then made one or two slip stitches – to gradually decrease the height of that last row and close it off. The last stitch was an invisible join. 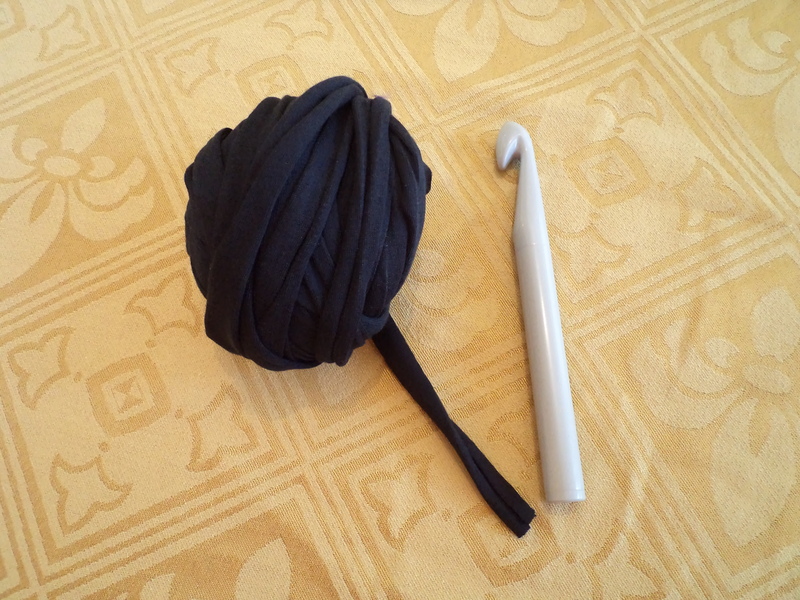 I discovered the special thing about fabric yarn: If it’s made from jersey – t-shirt fabric or the likes, it has that bit of a stretch, which makes it tighten a little at the top. In other words, it wants to be a little round basket. It keeps rounding itself as you crochet, even if by sheer math you have the right amount of stiches to create a flat base or straight-up row. Still, when I got to the top, I slip-stiched a trim, and decreased a couple of stiches to make it close in a little more. For the blue basket, I used the right side of the work for the outside, the “normal”‘ way. For the pink basket, I turned it inside out and used the backside for the outside – that’s because crocheting in the back loops made the spiral too visible for my liking. But the back side was cute, it looked round and pearly. I had the ends of the trim thread left, and so instead of weaving them in and cutting, I used them to tie a small bow for embellishment. The ribbon conveniently hid the end point of the spiral, which despite my camouflage efforts, did show a tiny jump in height. The hook was okay for the thread, but created a pretty tight “fabric”. If the thread had been any thicker, I would have needed a bigger hook. 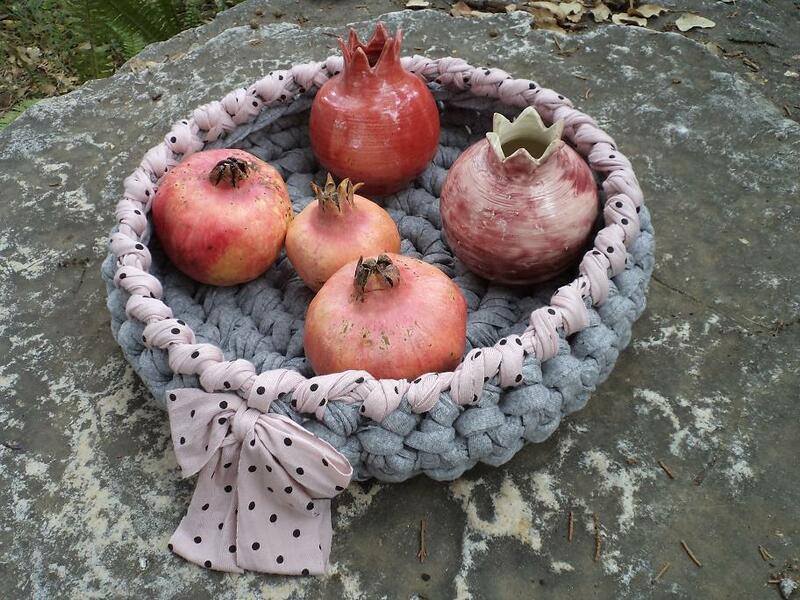 But the tight texture of the finished fabric was so cool, it made the basket pretty sturdy, and yet it had the softness and flexibility of the cotton knit it was made from. 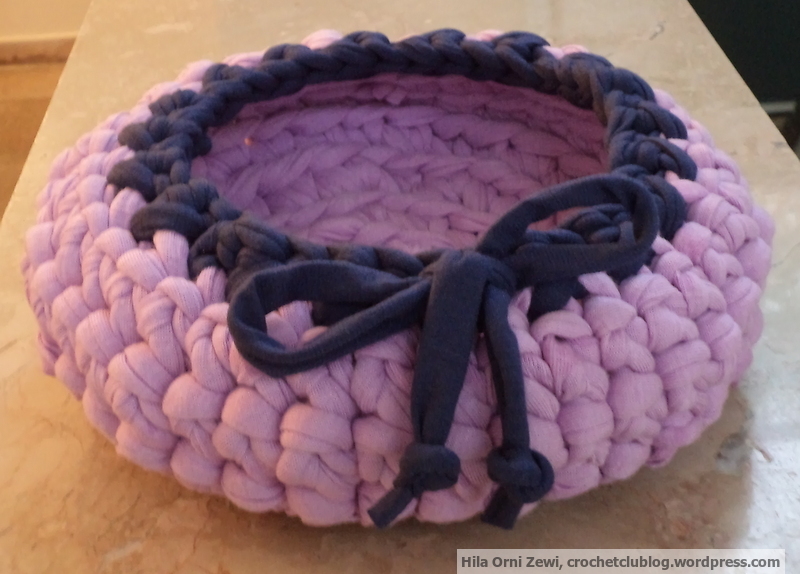 It made me think of a traditional straw basket – and I think that’s part of the appeal of fabric crochet. And the reason I became immediately hooked! (Oh, I was running late to the coffee meetup, so I just grabbed the camera and snapped this in pretty dusky lighting… I hope my next photos will be better). Dear reader: This content on this blog is copyrighted. 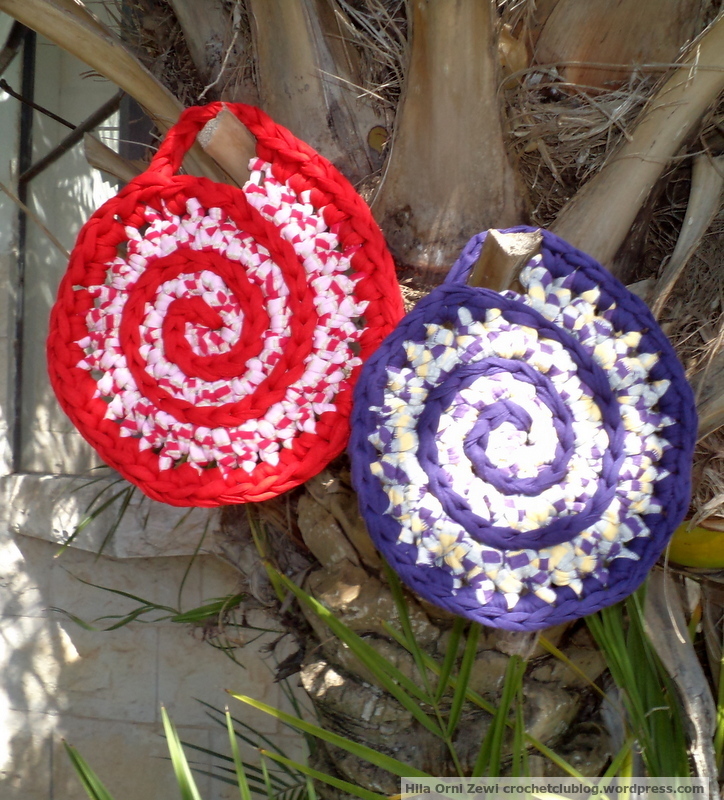 You are welcome to make a similar crochet project if you like my work. But please do not copy text or images without my permission – use the link if you want to share! Thank you. 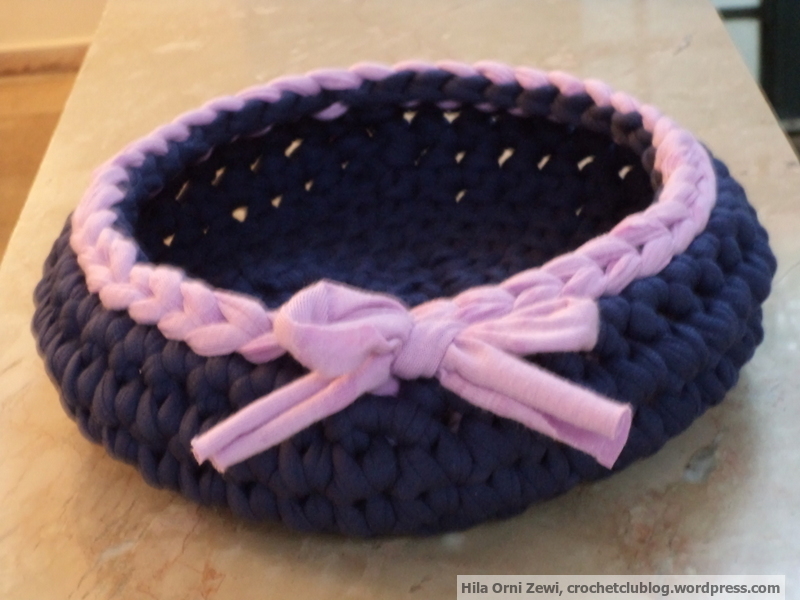 This entry was posted in Projects and tagged basket, crochet, DIY, fabric yarn, Projects, t-shirt yarn, tarn, trapillo, Zpagetti on August 12, 2014 by The Basket Fairy.